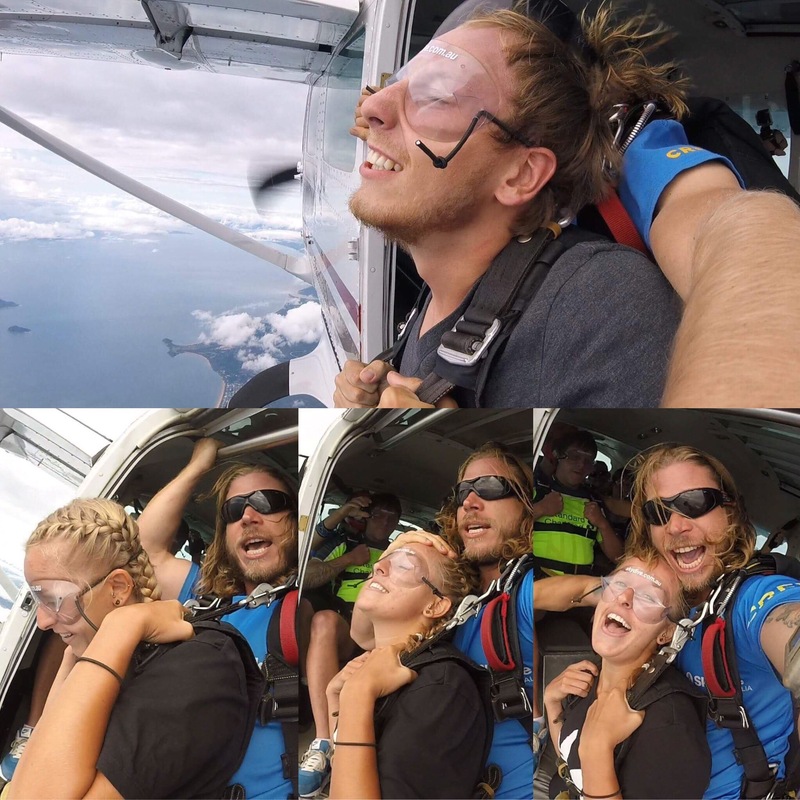 Our penultimate stop on our east coast adventure was to Mission Beach for the sole purpose of throwing ourselves out of a plane at 14,000 ft. That’s right, we were going skydiving! 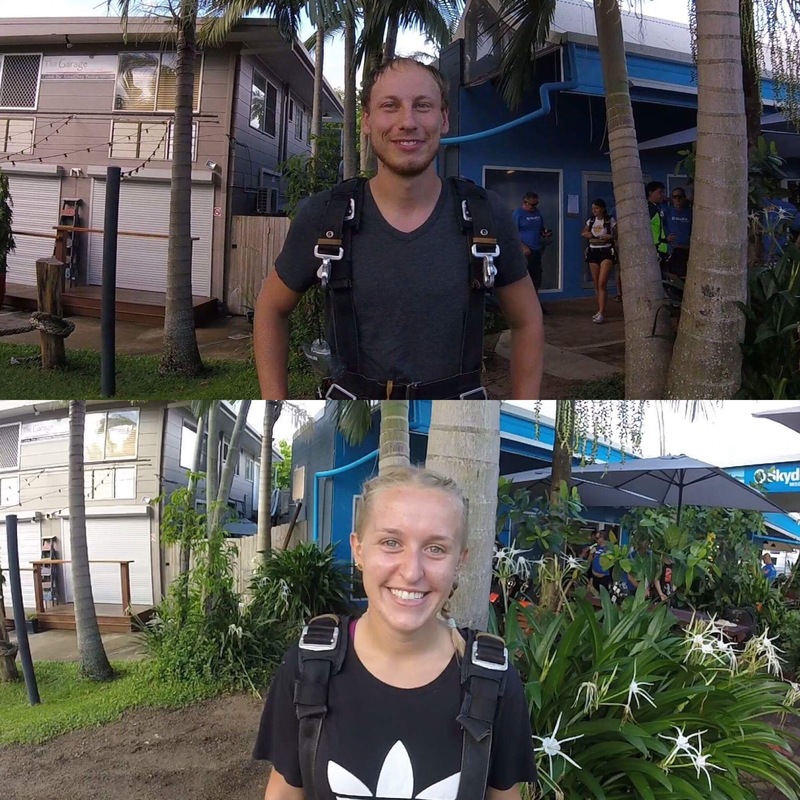 Both of us had always wanted to go skydiving and Mission Beach is the original, and still one of the few, places that you can land on the beach after your dive.We arrived the evening of the 4th March 2017 in the pouring rain so were a little nervous that our dive was going to get cancelled. After an early night we woke up at half past 6 for a 7am pick up. Thankfully, we had clear skies and so were feeling really excited for the dive. I don’t think either of us were feeling that nervous, really we were just excited for what we were about to do! Our dive wasn’t until nearly 9 so we had ages to sit and wait which, surprisingly, still didn’t make us nervous. We even got to watch the last group land on the beach before we got into our harnesses and got the bus to the airport! 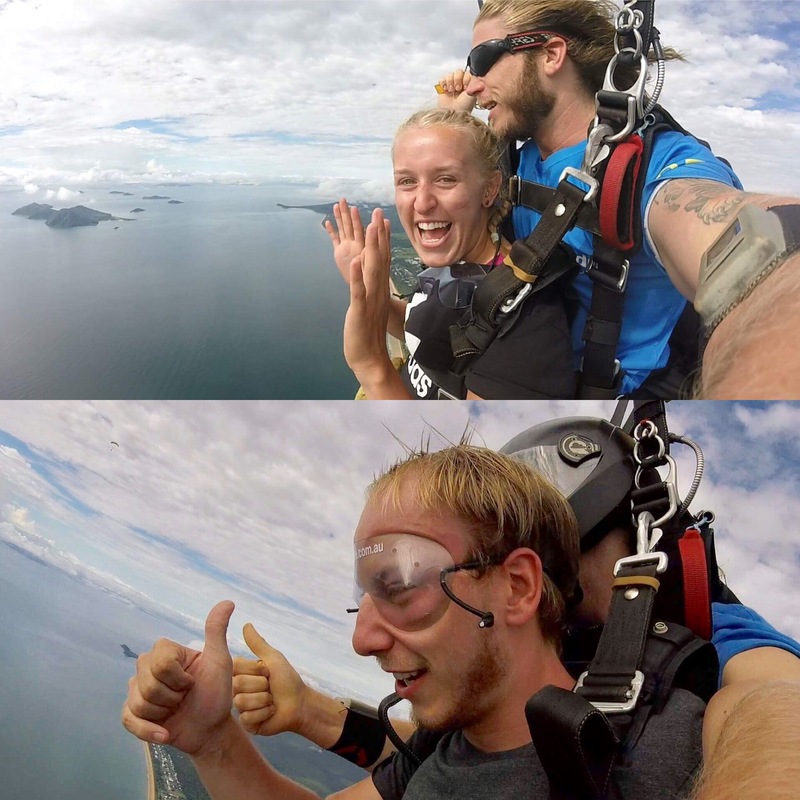 We were going to be doing the sky dive in tandem to a professional. Niall entrusted his life into the hands of an American called Thom and I put my trust in an Aussie called Ray. 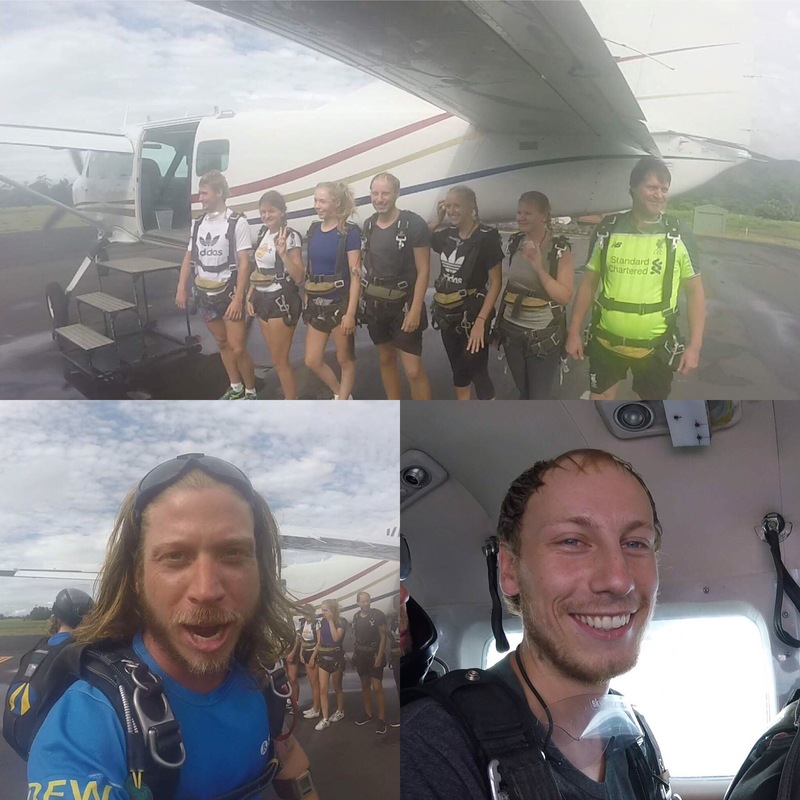 Both were experienced divers; Thom was also a base jumper and Ray entered ‘swooping’ competitions which involved jumping out of the plane at 6,000ft and opening your parachute straight away before following a particular route around a course and landing in a small box – this made me feel confident that the landing would be good! It was funny talking to Ray on the way to the airport about past dives. I was asking if anyone had ever fainted or been sick and he said that both had happened loads of times and that he’d had sick in his mouth before too from it! He joked that he was sympathy sick and that you may miss him but his sick wouldn’t miss you; and that if you fainted you didn’t come back and he just dropped you in the ocean so we joked about that on the way up which I think kept me from overthinking what we were doing! 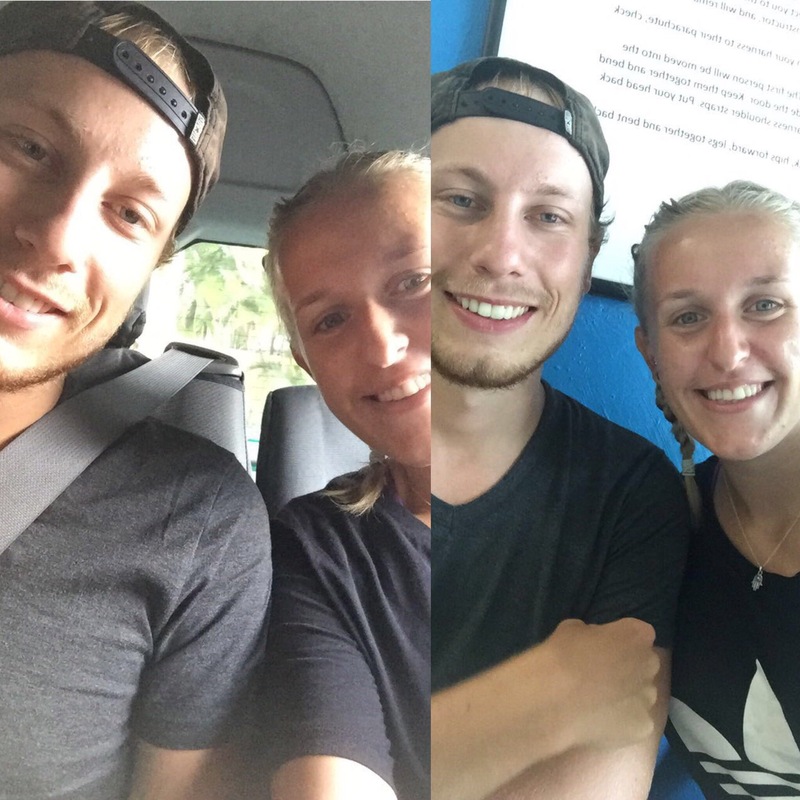 On our way to the airport I also saw a Cassowary which is an endangered bird that’s a little smaller than an Emu so that was real cool because it’s quite rare to spot them – maybe it was a good luck charm for the dive ahead! We all got a group photo in front of the plane before we took off. The plane was really small with just enough room for us all to sit on the floor in it. You would sit in between the legs of your diver and then would get hooked up to them at around 10,000ft. They all did video recordings of you and the ascent and talked to you whilst going up to check you were doing ok. Niall’s diver joked with my diver Ray that he hadn’t put my harness on properly and that they would hold onto my plaits if I fell out. I imagine you wouldn’t be able to make jokes like that with everyone you took up there but me and Niall found it funny and went along with it. 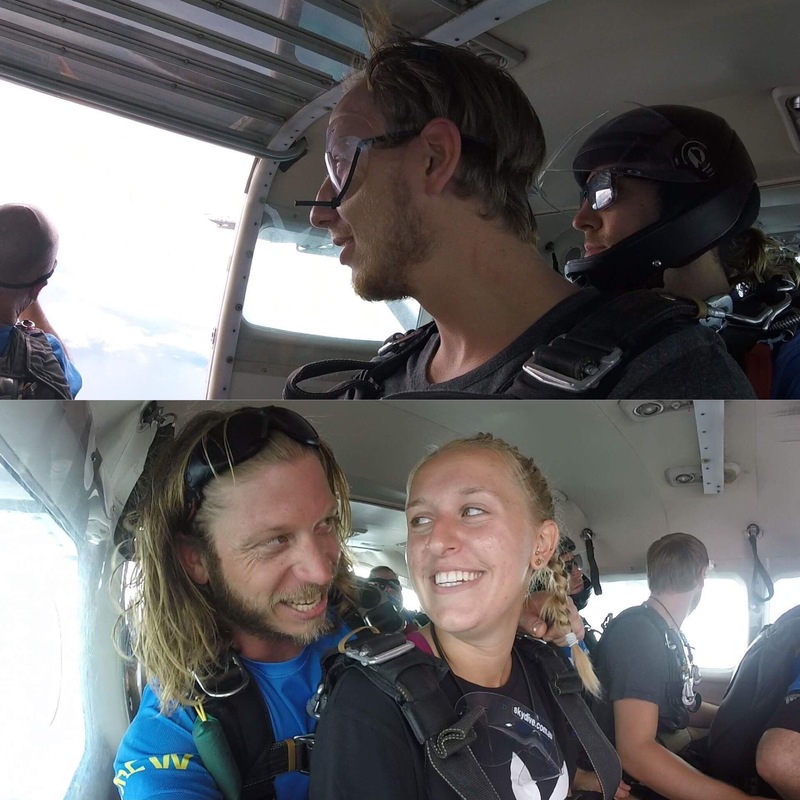 I don’t think either of us started feeling any nerves until people started jumping out of the plane. I was 2nd to jump and Niall was 5th out of 7 so he had a lot longer to think about what we were doing! 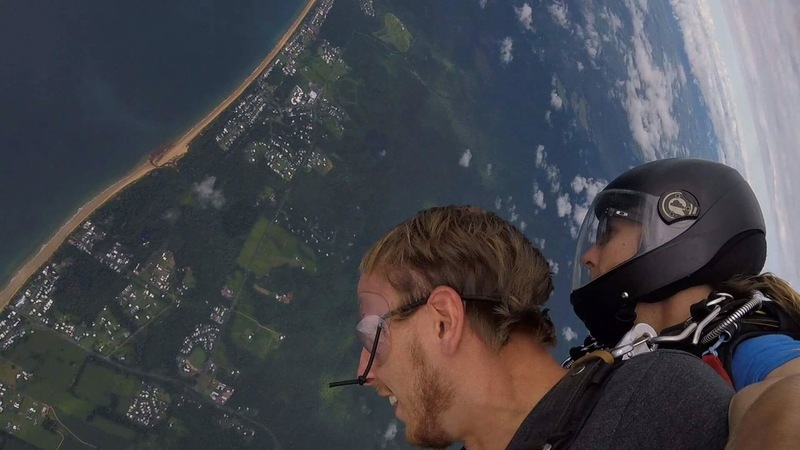 There is a funny clip from his video where someone jumps out of the plane and Niall just shakes his head in bewilderment. 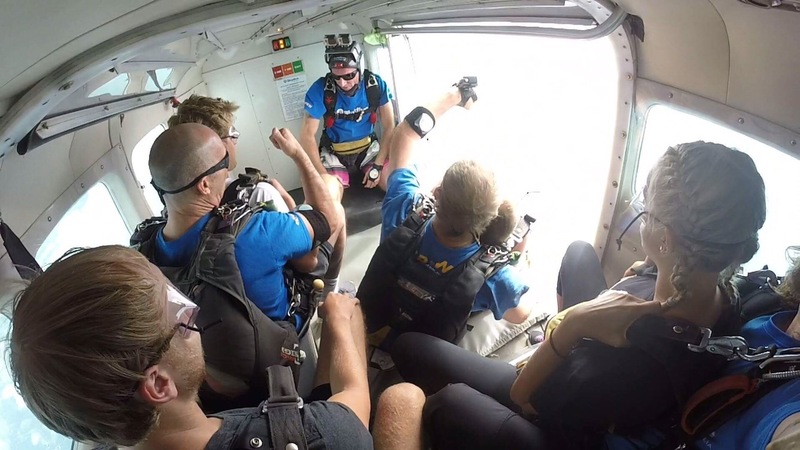 I can only really talk about how it was for me to jump out of the plane so will be focussing on that for the rest of the jump part of the post. 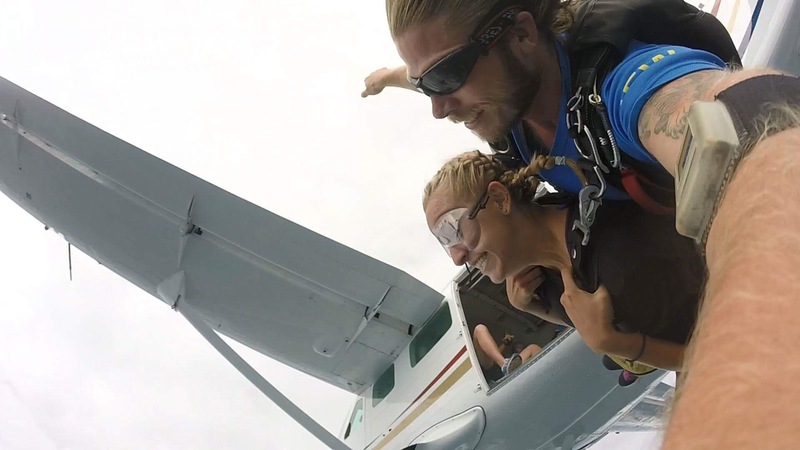 When it’s your turn to jump out of the plane you shuffle forward and dangle your legs out of the plane. You’re meant to put them under the plane but that isn’t remotely happening with the speed of the wind – you have pretty much no control of what your legs are doing! Then you put your head back against your diver’s (so in my case Ray) and he throws you both out of the plane! It’s going to be so hard to explain what it felt like and I probably won’t be able to accurately describe it, particularly as it’s all happening so fast! 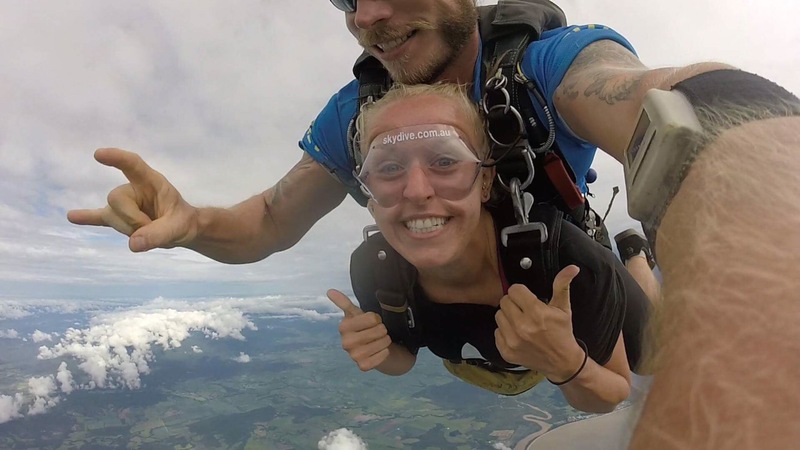 You are hurtling through the air, trying to focus on the view and what you’re feeling and what the wind is making your face do and all while not really comprehending that you’re free-falling through the air. It’s incredible. Your diver hits your arms and you have to put them out to your sides in right angles. Ray also got me doing the super man which was actually loads more fun that I thought it would be seeing as you are flying through the air. I honestly loved every minute. Now, normally, when the parachute is opened, you just shoot up through the air as it fills with air and then you glide along and that’s what happened to Niall. 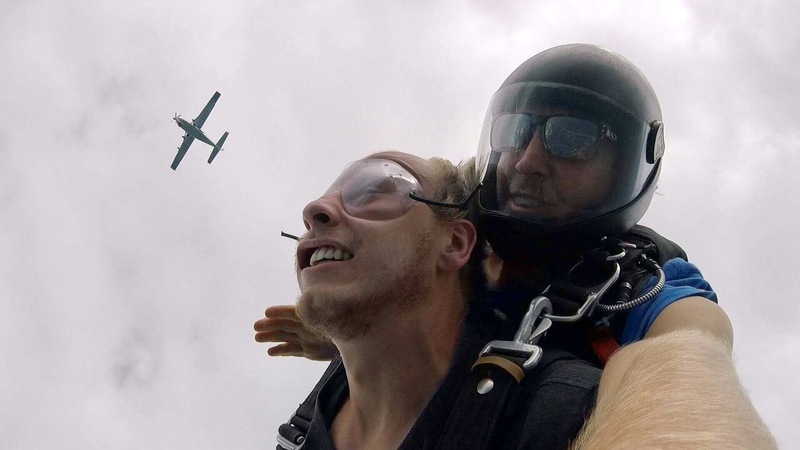 For me, however, I was spun and jostled about for a while (note nothing is really that long seeing as the whole thing is over in less than 10 minutes) before we shot into the air. I obviously didn’t know what it was meant to feel like so, although it didn’t feel fantastic and graceful, I didn’t think much of it until Ray told me that the parachute hadn’t come out properly and it had taken him a while to sort it whilst we continued falling through the air! 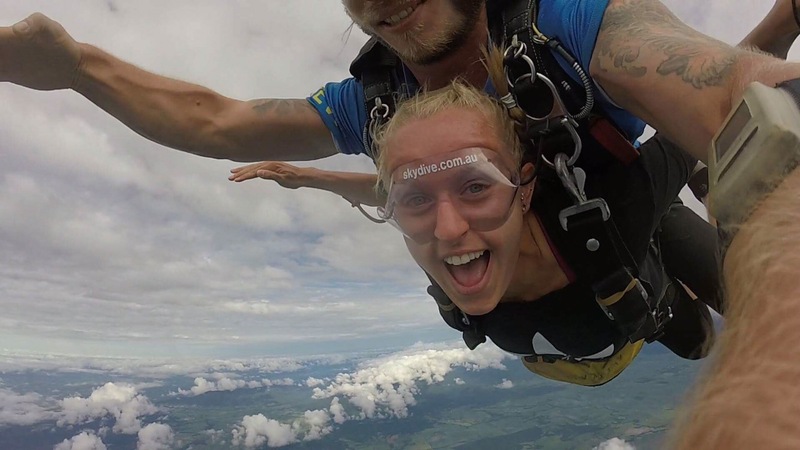 Somehow, I didn’t freak out at this – probably because I could see the fully opened parachute above – and instead just thought how mad it was that I had no idea that was happening and how crazy it was that I jumped out of a plane at all! Gliding through the sky by parachute is really cool and feels a bit like a rollercoaster as you swoop in circles around. I don’t know if Ray did it on purpose but he made us drop somehow which gave me a shock but I’m still not sure if it was to purposefully scare me or not. 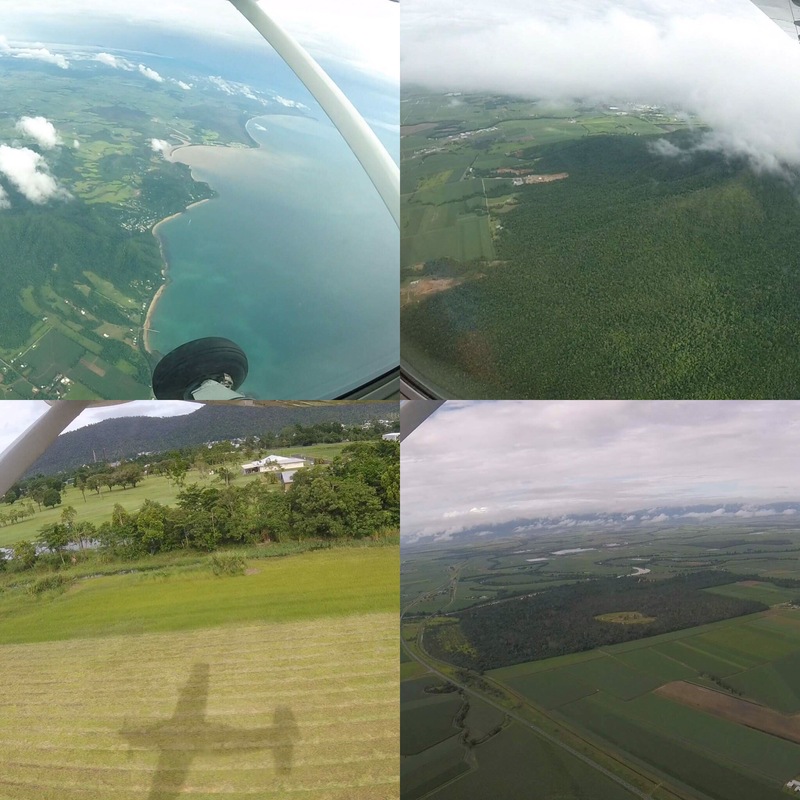 The views were incredible and it was just the best to be able to sit and look out on the Great Barrier Reef whilst so high in the air. Niall was also lucky enough to have a go at steering his parachute which he really enjoyed. 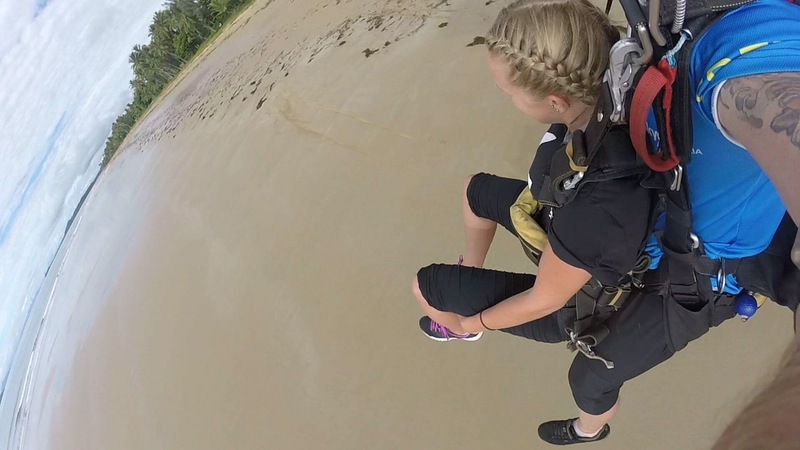 Our skydives ended by lifting our legs as high as we could whilst they swooped down and landed on the beach. Ray managed to land me on my feet whilst Thom landed Niall on his bum. Niall said he was surprised that it hadn’t hurt seeing as you’re coming down quite fast. They then unclip you and collect up their parachute before ending the video with last words and seeing if you enjoyed it. 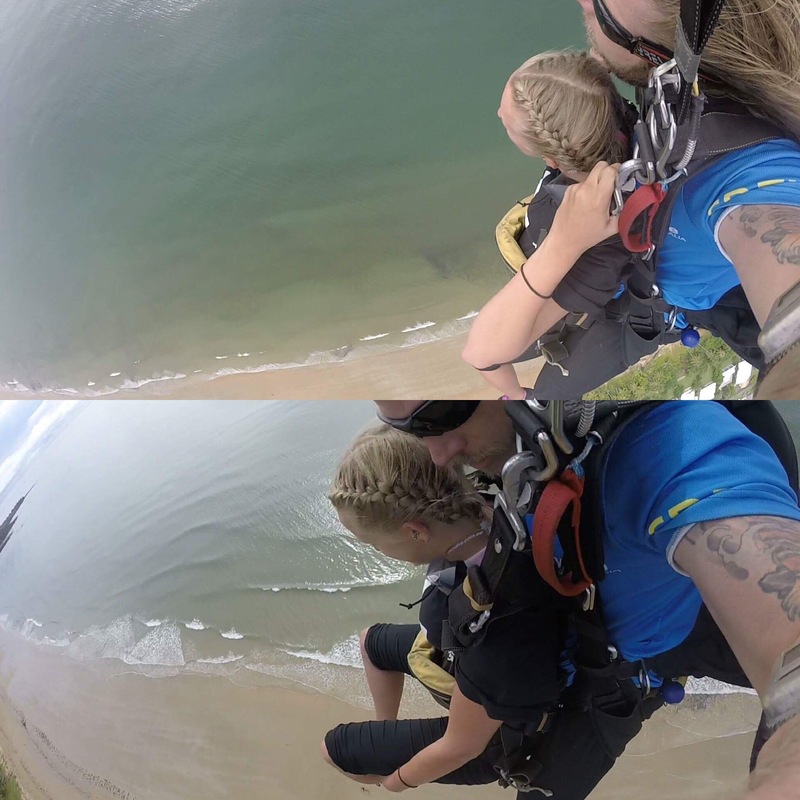 We were both on a high and it still doesn’t feel real that we jumped out of a plane and landed on the beach on the east coast of Australia. We both agree that it is one of the best things we’ve ever done and, if we had the money, we would definitely do it again. I would recommend it to everyone, you’ll love it and the feeling when you land having just flown through the sky is indescribable. It’s so hard to put into words how we felt and how much we enjoyed it but hopefully this post has given a bit of an insight into what we experienced.